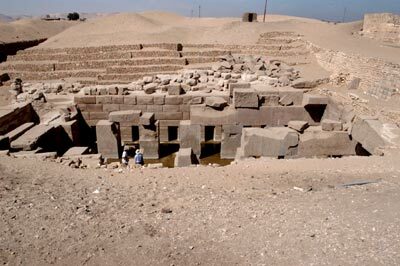 The nearly subterranean temple of Osiris next to the great Temple of Seti I at Abydos was completely covered in sand in the early part of the century. When it was uncovered, it was so stylistically different from the other ruins on the site that it was quite controversial. It looks strikingly like the simple valley temple of Chephren at Giza -- simple, square columns, totally devoid of decoration. It is built on the same axis as the Temple of Seti. 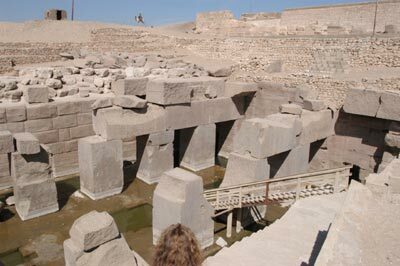 Or, as some believe, the Temple of Seti was built on the axis of the much earlier cenotaph here. There is some question as to whether Seti himself built the temple, or some earlier or later pharaoh. Stylistically, it is so different from the temples of the New Kingdom that it is almost an aberration. If Seti built this, he was breaking with the common architectural plans of his time. The foundations of the temple are below the current level of the water table, which floods the bottom of the temple. 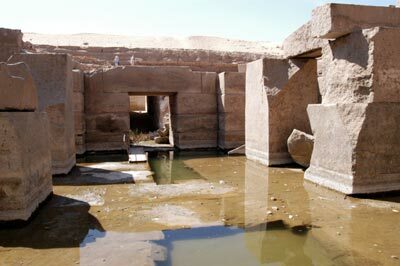 The water level is twenty or more feet higher today than it was in the New Kingdom, but it is assumed that the foundations were intended to be underwater when it was built as a reminder of the rise of the gods from the primordial sea.